Finally my right hand is out of the cast. While the recovery is slow, the strength is coming back and I started cooking again. (my wife was more than happy to turn over the set of cooking knives and all that they entail). To celebrate the fact that I can once again hold a knife and cut sashimi, I ordered blue fine tuna, yellow tail (hamachi) sashimi, and uni from Catalina. In addition, we had some left over caviar from Fine Caviar. We decided to indulge and make a few dishes that would go well with sake. 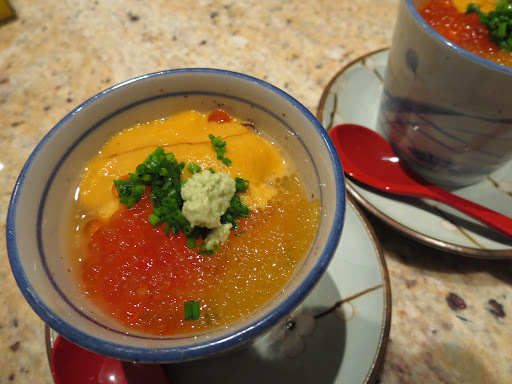 The first one was a Japanese savory (not sweet) egg custard (Chawanmushi 茶碗蒸し) which contained boiled quail eggs and was topped with salmon eggs and golden pike eggs (caviar) and uni. The chawanmush was served at room temperature (so as not to “cook” the caviar) and garnished with chopped chive and my usual “real” wasabi. I made the chawanmushi in the same way as before. I mixed 3 eggs (about 150ml) and 450ml of kelp dashi broth seasoned with light-colored soy sauce or usukuchi shoyu 薄口醤油, salt, and mirin みりん. I poured this through a fine-meshed strainer into individual small bowls. 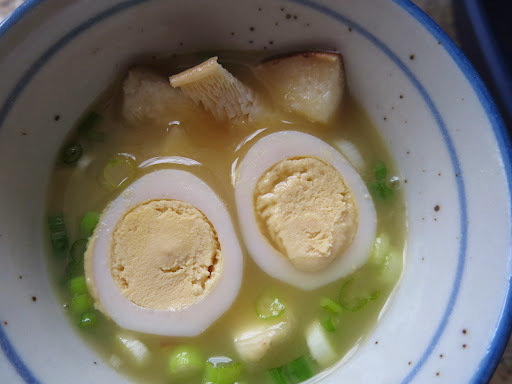 Since I was planning to top it with uni and salmon roe, I did not put in any meat or shrimp but just Ginko nuts (銀杏), (from a can), chopped scallion, and fresh shiitake mushroom (sliced) and boiled quail eggs (ウズラの卵, cut in half, from a can) as seen below. The amount of egg mixture made 6 small containers (actually soba dipping cups). I steamed them rather slowly using an electric wok for 30 minutes until the custard was set. I removed them from the steamer covered them loosely with a paper towel, and let them cool to room temperature. Except for the two we planned to eat in a few hours, I covered the rest with plastic wrap and move them to the refrigerator for future enjoyment. 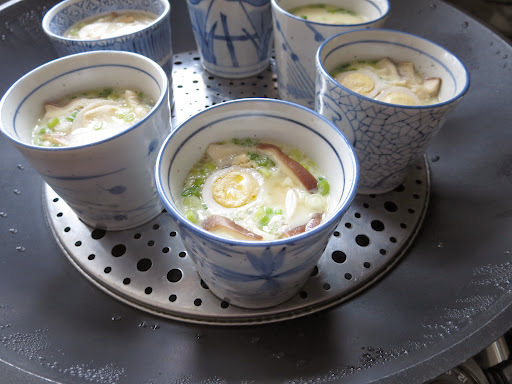 This is just a variation on the theme of chawanmushi. The uni was not one of the best (Catalina only had “Premium” but “Gold” is the best). 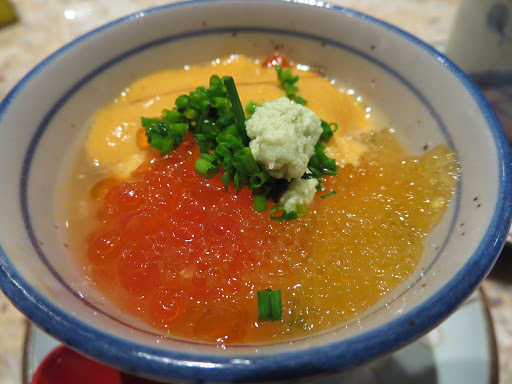 Although the flavor of the uni was good, the consistency was much softer and it had slightly slimy texture. Nonetheless the dish was adequately decadent. It was very good. We mixed up all the eggs and the egg custard and enjoyed the symphony of eggs.